The support of the audience helps during the performance, Azerbaijani gymnast Ivan Tikhonov told Trend. “I liked to perform in the National Gymnastics Arena. Home stands are always the best, support is excellent,” Tikhonov added. 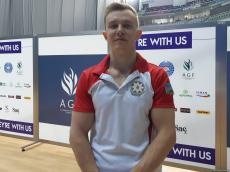 Summing up his performance at the qualifying competitions of the FIG Artistic Gymnastics Individual Apparatus World Cup, the athlete said that he would work on combinations. "The performance did not succeed, I slightly didn’t finalize it. The World Cup in Baku is the first start of the season, in three days we will go to the World Cup in Doha (Qatar)," he said. Qualifications are being held during the first two days of the four-day competition, while the finals will be held during the last two days. The gymnasts who will get the highest points for the performance will be awarded with the traditional AGF Trophy Cup.